For the full list of excipients, refer to item 6. I.
Powder and solvent for making solution for topical use. The powder is homogeneous, it forms compact, dry mass, white or light-beige. The solvent is colourless. – the genital tract during gynaecological procedures. Doses are determined by the doctor, depending on bleeding intensity. The product should be used at the site of bleeding. Prepare the solution according to instructions provided in item 6.6. Soak a sterile tampon or Spongostan with the solution and apply to the wound or apply the solution directly to the bleeding site. Hypersensitivity to active substance (bovine protein) or any of the other excipients listed in item 6.1. Bleeding from big blood vessels. Infected wound. Patients previously taking products containing bovine thrombin or any other bovine proteins should keep caution due to the risk of allergic reaction and haemorrhagic complications. In case of urticaria, lip and larynx swelling, breathing problems, hypotension, patients should immediately stop taking the product and start appropriate treatment. The product is not recommended to patients with afibrinogeneamia and disfibrinogenaemia due to decreased or absent therapeutic effect. Never take BioTrombina 400 together with thrombolytic drugs and thrombin inhibitors. There is no sufficient data available regarding the potential effect of Biotrombina 400 during pregnancy. Patient should consider benefits and potential risk after taking the medicine. There is no sufficient data available regarding the potential effect of Biotrombina 400 medicinal product during breast-feeding. Patient should consider benefits and potential risk after taking the medicine. There is no evidence that BioTrombina 400 will affect the ability to drive and use machines. Like all medicines, Biotrombina 400 can cause side effects. No undesirable effects have been reported after taking BioTrombina 400. In patients who were taking other products containing thrombin, presence of antibodies against bovine protein and bovine thrombin has been reported. Blood antibodies may rise after each subsequent administration of bovine thrombin. In very rare cases, produced antibodies can cause allergic reactions, including anaphylactic reactions, bleeding of various intensity and delayed thromboembolic complications. First symptoms of anaphylactic reaction may include disturbance of consciousness in the form of fear and the feeling of danger. There may occur itching of lips, tongue, palate, breathing problems related to swelling of the oral cavity, tongue; wheezing; hypotension, fainting, systemic urticaria, pruritus, vomiting. No data concerning drug overdose is available. Thrombin is a proteolytic enzyme catalyzing the blood coagulation process. It is involved in the final phase of the coagulation process, during conversion of fibrinogen into fibrin and clot formation. 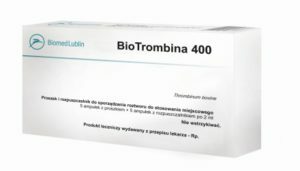 BioTrombina 400 administered according to a proper procedure and in a correct dose allows to contain bleeding within a few minutes even in patients with different types of bleeding diasthesis (except for fibrin deficiency) involving impairment of prothrombin conversion into thrombin (e.g. haemophilia A and haemophilia B). Studies in mice have shown no excessive toxicity. Most probably, administration of bovine thrombin products in mice causes minor risk of developing autoimmune diseases such as lupus or antiphospholipid syndrome. No such complications have been reported in humans. Do not blend the product with other medicinal products. Store refrigerated (2oC — 8oC). Type I glass vial closed with a rubber stopper protected with a cap. 1 vial with the powder + 1 ampoule with 2 ml of solvent in a cardboard box. 5 vials with the powder + 5 ampoules with 2 ml of solvent each in a cardboard box. 5 ampoules with the powder + 5 ampoules with 2 ml of solvent each in a cardboard box. Not all pack sizes must be traded. Dissolve ampoule or vial content in 2 ml of the solvent (isotonic sodium chloride solution), next soak a sterile tampon or Spongostan with the solution. After reconstitution, the solution is clear. Before administration, inspect reconstituted solution to detect presence of any foreign particles and (or) irregular appearance. In case of any irregularities in appearance of the solution, do not use the product.